SPECIAL OFFER: If any of the Lucky 15 bets below contain 4 winners out of 4 selections (or all 4 placed in Gary's /£million Lucky 15) I will refund EVERY Member their subscription fee. And you can keep the £25 Festival Trends Voucher! As always when doing a bet of this nature we have to be a bit realistic. The chances of hitting a £ million are slim and it's more likely than not that we will lose our money. On the upside is that, because of the odds, we don't have to invest too much to give us a chance of winning a big payout so even if all 4 selections blow out we won't do too much damage to our betting bank. Both of my last two attempts at the £1 million Lucky 15 did show a profit though as they included a 33/1 winner and two big priced placed horses so there is always hope of a good return. But basically, please bet sensibly and please be realistic about our chances. With 5 of the last 6 winners returning 25/1 or bigger we have a great chance of an upset in this race. I gave MERCENAIRE a good write-up in the Emerging Trends post from the other day and I also put it up as a Route 66 Ante-Post bet back in December. It seems to have a perfect profile and hopefully will go well as our first runner. TRAFFIC FLUIDE has been on my radar for this race for a long time now and it was re-assuring that his trainer confirmed in a recent interview that this race is the intended target. Gary Moore has a good record in the Plate Handicap with 2 wins and 2 places from 5 runners. He began this year running in an Aintree handicap off 156 but has now slipped to just 140 thanks to some poor showings in some of the most competitive Grade 1 races of the Season. He's never liked soft ground and all his best form has come on good Spring ground so I'm prepared to forgive his poor form this Season and judge him on that Aintree handicap run back in October of last year. It was an absolute cracker of a handicap and his 4th place finish was a good effort with the likes of Gods Own, Tea For Two and Aso all behind him. He actually gave weight to the second Cloudy Dream that day. From a 16lb lower mark he makes a lot of appeal in this handicap especially if the ground has dried out a bit by the Thursday of the meeting. The last 4 winners of this race have been at double figure odds and it also throws up the odd 33/1 winner so is another race we have a chance of an upset in. COUNT MERIBEL is a 14 time raced novice hurdler who, when upped in trip, began this Season looking like he would take high order in the staying ranks but after going down narrowly to Kilbricken Storm in a Grade 2 at Cheltenham in December he's struggled to run up to that form in two subsequent runs when the stable was going through a poor patch. Backing experienced horses with Grade 2 form in this race is usually a good tactic and with his trainer showing much better form over the last month he's worth chancing at massive odds. A £1 each way Lucky 15 at 25/1, 33/1, 50/1 & 20/1 pays £1.2 million when you include the 10% Bonus. You may be able to beat those prices but aren't guaranteed a £1million payout with some of the smaller bookmakers. 4 horses I've had my eye on for quite a while. 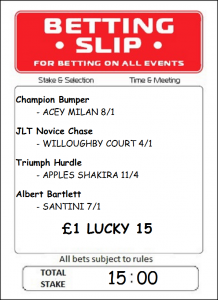 This week's Lucky 15 will focus on what I consider to be the best 4 bets from across the Irish Sea. The first race we'll be looking at is the Albert Bartlett Novice Hurdle Final from the Friday of the meeting. Before 'trends buster' Unowhatimeanharry landed this race in 2016 we had some of the strongest trends of any race at the Festival. I think it's possible to make a case to overlook some aspects of his trends profile as he'd only joined his trainer Harry Fry at the start of that Season and this obviously kickstarted his transformation into a top class stayer. If we put that years result to one side we can see those super strong early trends were carried on for last years winner Penhill. The race has been run since 2005 giving us 13 individual winners of the race but, if for the time being, we forget the 2016 result running there had been 214 runners in the other 12 renewals (2005-2015 & 2016). Meaning that those 12 winners of the Albert Bartlett Hurdle were all male, 5-7yo's that had finished top 4 in a Grade 2 Hurdle over 2m4f-3miles on their last run which was more than 25 days ago. By simply backing these types over those 12 renewals of the race you would have had 12 winners from just 39 such types and made a profit of 107.64pts. That looks pretty impressive and applying these 6 trends to those entered this year it incredibly leaves just 3 of the 83 declared runners! Those three are the 1-2-4 from the recent Ballymore Classic Novice Hurdle run on Cheltenham Trials Day, namely: Santini, Black Op and Mulcahys Hill. I liked the way the winner went about his business that day and I'm happy to go with the form of that race, although backing all 3 wouldn't be the worst idea at current odds of 7/1, 12/1 and 33/1 (NRNB) or 8/1, 20/1 & 33/1 without the NR protection. JLT NOVICE CHASE: WILLOUGHBY COURT (4/1 NRNB) - This race could really cut up badly with most of the runners quoted towards the top of the market seemingly having other objectives so it makes sense to go with one of the runners confirmed to race here. He was the winner of the Neptune Hurdle last year and Willoughby Court began his chasing career with a novice and a Grade 2 win but, unsurprisingly, was unable to confirm his level weights beating of top hurdler Yanworth when asked to give that rival 5lb on heavy ground on their next meeting. Back to level weights on better ground he should confirm earlier running should his great rival show up here. TRIUMPH HURDLE: APPLES SHAKIRA (11/4 NRNB) - She's unbeaten in 4 starts (1 in her native France and 3 since coming to the UK) and has looked a very decent juvenile each time. Her dismissal of Gumball on her UK debut in a Grade 2 hurdle at Cheltenham was a visually stunning performance that had the ratings and time boys drooling and has been followed up with another course Grade 2 win. She's the one they all have to beat in March. CHAMPION BUMPER: ACEY MILAN (8/1 NRNB) - Anthony Honeyball's 4yo NH Flat horse got beat on his debut but has since rattled up a hat-trick in impressive style. A comfortable 9 length win at Wincanton in early December was followed up with victory in a Listed contest at Cheltenham on New Years Day where he posted some big speed figures. He took another Listed contest on his fourth run when after travelling well he quickened clear from the 2 furlong pole to record an 11 length win. That Newbury race has been a good pointer to the Champion Bumper in recent years and his trainer has had the runner up in the Champion Bumper from just 2 runners in the race. He's the best of the home team and should go very close. Please remember to back them with a firm offering NRNB. I've used Bet365 for my bet. 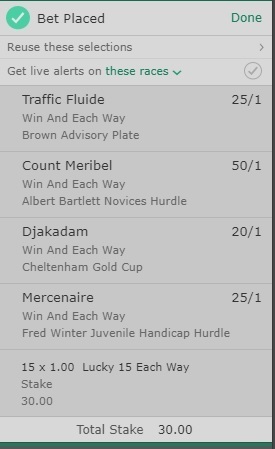 I'm going to kick off the Ante-Post Tuesday feature post with a Yankee on 4 of the big Championship Races at the Cheltenham Festival. Using the information contained in the first of the Stats Guides that I published last week (download here) I'll narrow the field down before picking the likeliest trends winner. 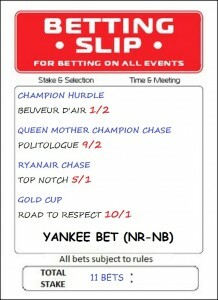 I suggest placing the bet with a bookmaker offering the non runner - no bet concession. Ideally we want a 7-9yo rated 165+ who has run 3-5 times this Season and at least 8 times in their career. A rest of at least a month since their last start would mean that you wouldn't really want your selection to be having a run anytime after this coming weekend (10th/11th February). 10 of the last 11 winners had a run at Kempton, Newbury or Leopardstown last time out but those coming on from Cheltenham are 0 from 29 in the same time period.